We understand how important knowing the ETA, and that is why we have improved how it is getting measured. We removed straight line distance and changed it to driving distance. By using Driving distance, it factors in the driver's current route and traffic condition when calculating the estimated time of arrival. We also added a buffer on the ETA to give the drivers some leeway around customer expectations. a. 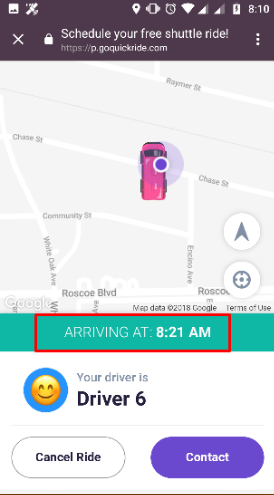 If the passenger is waiting it will show what time the driver will pick them up. b. If the Driver is "en route" it will show the shuttle's ETA to the drop-off location). On the passenger app, Passengers can also see the ETA. It will appear on once the Driver starts driving towards the passenger's location.